Hackers launched a distributed denial of service (DDoS) attack against Dyn this morning. The attack, which lasted around two hours, was responsible for taking down or interrupting traffic to a host of popular websites. Including your favorite, probably. The Domain Name System (DNS) How To Change Your DNS Servers & Improve Internet Security How To Change Your DNS Servers & Improve Internet Security Imagine this - you wake up one beautiful morning, pour yourself a cup of coffee, and then sit down at your computer to get started with your work for the day. Before you actually get... Read More routes visitors to the right destination by matching legible domain names with numerical IP addresses. It is therefore a rather integral part of the internet. Until someone disrupts it. At which point it’s less than useless. At this point people trying to reach countless websites, including Twitter, Reddit, GitHub, Etsy, Imgur, PayPal, Spotify, Yelp, and the PlayStation Network all reported problems. It then became clear this was mainly limited to the east coast of the United States, with isolated outages elsewhere. All services were “restored to normal as of 13:20 UTC”. So if you notice any of your regular haunts playing up again, it’s likely to be either another targeted DDoS attack What Is a DDoS Attack? [MakeUseOf Explains] What Is a DDoS Attack? [MakeUseOf Explains] The term DDoS whistles past whenever cyber-activism rears up its head en-masse. These kind of attacks make international headlines because of multiple reasons. 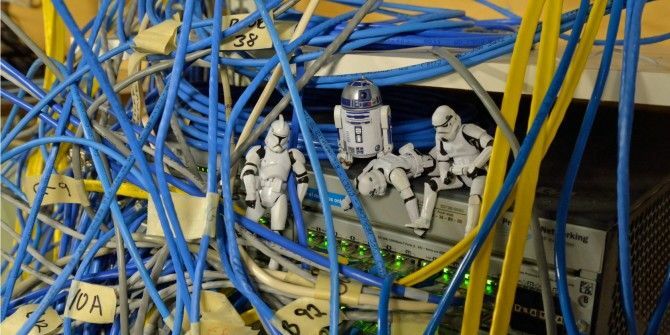 The issues that jumpstart those DDoS attacks are often controversial or highly... Read More , or your crappy internet connection. The source of the attack hasn’t yet been identified. However, the size and scale of the attack suggest it’s someone with the skills to pay the bills. The handful of people still using Twitter (yes, they still exist) are currently speculating over who was responsible. Guesses range from Donald Trump to Vladimir Putin. Were you affected by this DDoS attack on Dyn? Which website(s) did you notice acting all weird? Who do you think is to blame? And why? Please let us know in the comments below! Explore more about: DDoS, DNS, Hacking. I noticed that the UK Parliament website was down, as well as Twitter. I managed to find enough of the Urls and IP addresses that Twitter uses to let me create local entries in my hosts file, and it worked fine after that. Thanks Obama. That's the obvious answer*. *It's not really the obvious answer. The preceding statement was a joke. Please resume your normal Internet surfing routine. Assuming you can reach your next website.